Hello, Felix and Flanders. Felix and Flanders. are large solid rough and tumble tuxie guys with hearts of gold. Kitties are heavily bonded, sweet loving, gentle, good with dogs. The are good with kids. They play like crazy and will make you laugh. These boys need a new permanent home. They have no bad habits except they sound like horses playing at times because they LOVE, LOVE playtime. If you want two rolly poley love bugs, here they are. We offer a 2 week trial to make sure they are compatible with your family. They are up to date on vaccinations, already neutered, they have been checked for feline aids and feline Leukemia and are negative. These guys deserve to move into another home not a foster situation. They are $100 per kitty, $200 for both fully vetted kitties, almost unheard of. These kitties are a steal at this price. The are located in Concord. Thank you for looking at our rescue kitties! We have new kitty available weekly. Our process takes 3 to 5 days, as we work full time besides cat rescue. Thank you for viewing our Snow Camp Rescue kitties, we appreciate you! 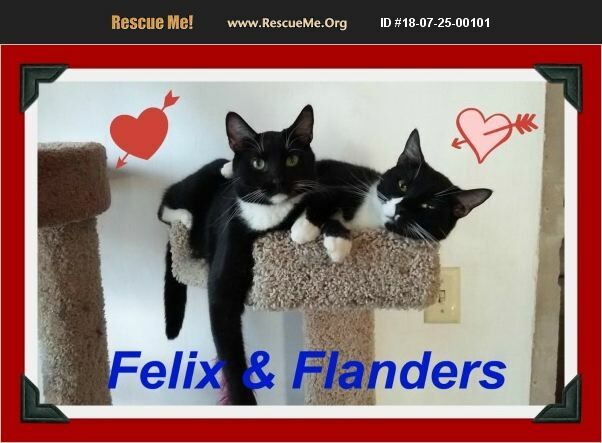 Felix and Flanders can go to out of state approved adopters and we will help with transport as well. Please request an adoption application and Carrie or I will send you an application.